Abstract: There are many elements that define Celtic culture, though defining Celtic culture is not simple. In short, the cultural traditions of Ireland, Scotland, Wales, Cape Breton, Galicia, and Brittany are condensed into what is known as Celtic, and there are many contributing factors that aid the Celtic phenomenon. How the modern idea of Celtic culture came to be was through cultural unification in the nineteenth and twentieth centuries. Historical accounts recognize how the musical traditions of Celtic regions changed over time; particularly, the nineteenth and twentieth centuries (with their vast modernistic qualities) aided European political discourse to unify colonies. Through unification, the musical traditions of the Celtic diaspora were greatly impacted, resulting in a Celtic culture that today’s society views and understands. One angle of viewing such historical and political accounts is through the commodification of Celtic music. In part, recording technologies in the nineteenth and twentieth centuries allowed more people to access music from the Celtic diaspora, and as the technologies evolved, more people were accessing music at a faster rate. Mass media, then, sought to market Celtic music in ways that conveyed Celtic as one culture. However, mass media is not the only outlier in commodifying Celtic music. Specifically, my paper will discuss these impacts from a library sciences standpoint as I seek to understand how music was acquired, processed, organized, and stored in libraries, museums, and archives (collectively, information organizations) as such institutions helped shape modern Celtic culture. There are many elements that define Celtic culture, though defining Celtic culture is not simple. In short, the cultural traditions of Ireland, Scotland, Wales, Cape Breton, Galicia, and Brittany are condensed into what is known as Celtic, and there are many contributing factors that aid the Celtic phenomenon. Technological advancements over the past several decades paved new ways for elements of Celtic culture to be acquired, processed, stored, and shared; in result, it has a much broader (meaning, global) audience because of increased access. While twentieth-century mass media plays a significant role in this increase of access, there are other ways through which access to Celtic culture increased. Though the mass media’s role in Celtic commodification is highly significant, there are other important contributing factors. From a musical standpoint, it is important to acknowledge that music is a social process and is a way of information sharing and exchange. Pre-mass media, informational exchanges required face-to-face interaction; if one wanted to learn (or learn about) a musical tradition one had to either physically attend a live performance or receive lessons from a guru. Today’s musical practices still involve physical interactions, but modern developments (specifically, in the library and information sciences) provide other ways which one can study a musical tradition. With the advent of libraries, museums, and archives in nineteenth-century industrialized England and America, resources about musical traditions became easier to access. Keep in mind that libraries, museums, and archives (collectively, information organizations) have been around since antiquity; however, these types of institutions were not open to everyone and information withheld was not easy to access. Because the modern information organization seeks to make information as accessible as possible, fundamental roles shifted. Several issues arose from this shift as there were no codified standards in how these institutions should be run. The new roles of information organizations are public service oriented. One aspect of this new foundation is to keep materials organized so patrons can find, access, and use them accordingly. While organizational standards (known as cataloging standards) have been around since information organizations’ beginnings, it was difficult to manage materials held in an institution as there was no set of codified standards. Once modern cataloging standards were established, things began to change as information became more readily accessible. How did these standards aid in commodification of Celtic music? First, it is important to note that modern cataloging standards are of Western origin. This is crucial to the examination of the effects of modern cataloging standards as (1) many areas of the Celtic diaspora were colonized, and, (2) modern cataloging standards were developed in England and America. Therefore, through acquisition, processing, organization, and storage of musical materials, information organizations were an avenue all their own for commodifying Celtic music. Because Celtic is used as the comprehensive term for the musical traditions of many regions, it can be argued that Celtic is an imaginary phenomenon as (1) each region has its own distinctive elements, and, (2) many Celtic musicians do not consider themselves as Celtic but as of their native land. As contemporary views of Celtic culture are commodified, to examine commodification in the entire Celtic diaspora is beyond the scope of this paper (Reiss, 2003, 164 -165). In choosing a specific region to discuss, there were many factors that needed to be considered—mainly, historical and political—and as the development of information organizations took place in England and America, it made sense to focus on Ireland because of its relations with these colonizing forces. Though colonized by the British, many Irish people fled to America due to political and economic troubles, yet still faced discrimination. The history of Irish discrimination is largely religious, “beginning with Henry VIII’s break with the Catholic church in 1532 and his subsequent takeover of property belonging to Irish monasteries” (Hast & Scott, 2004, p. 27). Over the next several centuries, Catholics in Ireland were increasingly marginalized, resulting in the emigration to places such as America (Hast & Scott, 2004, p. 29). However, Irish Catholics were still subject to discrimination in America because of established stereotypes. For example, the Irish were called “white savage[s]” because of their harshness (Williams & O’Laoire, 2011, p. 139). In spite of such marginalization, the Irish were able to (somewhat) preserve their culture through nationalist movements in the nineteenth and twentieth centuries (Hast & Scott, 2004, pp. 36-41). From this preservation, information organizations were/are able to acquire, process, organize, and store information about Irish traditional music. Unfortunately, in preserving their local culture, the Irish people inadvertently (at least, in part) altered it. To preserve a culture, certain alterations are required (e.g. digitizing an aging print resource) though such alterations are problematic. Michèle Valerie Cloonan (2001) reports on how preserving culture, quite frankly, is a paradox because preservation generally requires alterations (p. 235). Essentially, “it is impossible to keep things the same forever,” especially in the digital age, as technology continues to evolve (Cloonan, 2001, p. 235). Therefore, preserving a cultural tradition is difficult because traditions change over time. These changes, as John Miles Foley (2012) argues, are constant, and, “because cultures are emergent—changing right now and then changing again and again without ceasing—they are constantly in the process of becoming something else (p. 69). Perhaps this is why preservation is a “relative rather than absolute concept because objects change over time as do our approaches to viewing and interpreting those objects” (Cloonan, 2001, p. 235). In objectifying culture, then, materials are inappropriately represented. For example, the effects of colonialism are still present in how information is organized because of the taxonomic system that was imposed onto indigenous cultures. Because different cultures “experienced colonization…at different points in a range of histories,” understanding colonialism can help information scientists and librarians in the organizational process (Duarte & Belarde, 2015, p. 680). As for Irish traditional music, “the dynamism…today is reflected in the many paths that musicians take in the approach to its performance” (Hast & Scott, 2004, p. 121). What used to be an “intimate world of house parties among family, friends, and neighbors” is now seen on public stages across the globe (Hast & Scott, 2004, p. 121). In part, the mass media and developments in the music industry created this new avenue for performing Irish music, though nowadays one does not necessarily need to attend a live staged performance as one can view video recordings on websites such as YouTube. The significance of YouTube and similar sites is beyond commercial, as Robert Gehl (2009) argues that the structural design makes it “an archive awaiting curators” (p. 45). Perhaps because YouTube “[did] not produce any original content of its own”—I insert did here as YouTube has recently began producing original content—it was seen as a way for outside sources to store and share content (Gehl, 2009, p. 45). It is through the storing and sharing of content that YouTube is an outlet for informational exchanges, yet some scholars argue that because the information stored in YouTube is regularly used, YouTube is not a proper archive (Gehl, 2009, p. 46). I will confess to using YouTube on a regular basis for my ethnomusicological research, perhaps taking advantage of such a site. However, since society is increasingly digital, sites such as YouTube are ever more important because of the types of information stored and shared. Although, not everything housed in YouTube is scholarly material as it “accept[s] just about any media object from users” (Gehl, 2009, p. 47). The acquisition of materials from the user community, though, is what makes a site such as YouTube unique in comparison to other archival sites, but before discussing other archival examples, it is first important to explain the evolution of information organizations. In addressing the development of information organizations, it is important to discuss heritage and folkloric study as these fields contribute a great amount to the library sciences. Mainly, such studies were originally ethnographic in nature, requiring people to collect data on certain populations and write reports based on those data. While heritage and folkloric study provides information about the past, Noah Lenstra (2014) indicates that heritage is more than the simplistic “dictionary definition of stuff passed down across generations” because people can use heritage information to make connections to the past (p. 3). However, “heritage refers not to historical scholarship, but, rather, to intimate stories…to which one is attached,” meaning that heritage is not exactly academic (Lenstra, 2014, p. 3). Folkloric study, on the other hand, is an academic discipline, though modern technology has caused the field of folklore to dissipate (Blank, 2009, p.1). As Trevor J. Blank (2009) argues, “folklorists [need to] look to the Internet, not only to expand our scholastic horizons but also to carry our discipline into the digital age” (p. 2). Blank (2009) asserts this argument by examining the increasing amount of literature pertaining to folklore and the Internet, yet many scholars in the field of folklore have not changed their practices as they are still too focused on the past (pp. 3-4). However, the need to obtain and use information from the past is on the rise. Lenstra (2014) examines this trend through the lens of information organizations, commenting on users’ increased need for past information (pp. 3-5). In fact, “since the beginning of the public library profession, librarians have innovated with information technology to meet individual, family, and community needs” (Lenstra, 2014, p. 3). Though the need for past information is not new, the way in which users interact with such information is. Technological advancements, then, not only change the way information is acquired, processed, organized, and stored, but also how users are able to find, obtain, and effectively use such information. The role of information organizations (as already mentioned) has become public service oriented because of the increased demand for (and supply of) accessible information. In this sense, information organizations can be viewed as marketplaces because users are able to “shop” for what they need either in-person or online. 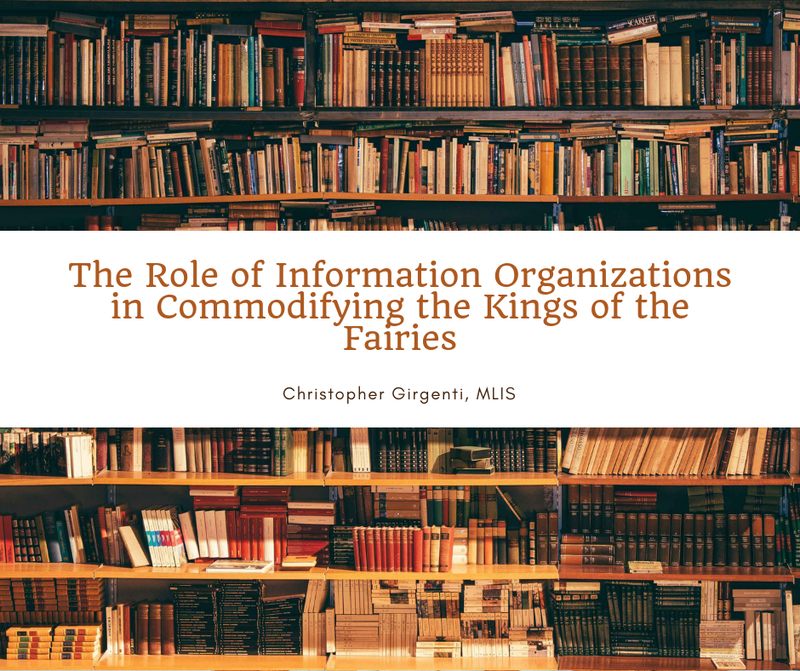 Because of how modern information organizations are run, I argue that information organizations are commodities. It is through the acquisition, processing, organization, and storage of materials that information organizations act as places of trade and commerce. To fully understand how information organizations aid commodification, it is necessary to examine how information organizations are run. Usually, there are two broadly defined departments within a typical information organization setting: public services and technical services. The former consists of reference and access services, and employees in these areas directly deal with patrons; in addition, employees in these areas handle materials that have already been processed and organized (as this happens in the latter). Technical services employees, in comparison, do not directly interact with patrons as their job is to acquire, process, and organize information. While the above describes modern information organizations, an explanation of how things got here is in order. Because of my experiences as a cataloging assistant I will focus on the development of technical services (which will, in turn, provide some insight to the public services sector). To recap the introductory portion of my paper, modern organizational (cataloging) standards developed in the nineteenth and twentieth centuries, though, more importantly, these standards were developed in England and America. Therefore, modern cataloging standards are Western in origin, and the effects of colonialism are still present because of the cataloging process. Today’s cataloging standards are based on the 1961 Paris Principles, though American and British librarians have been in cooperation since the mid-nineteenth century (Taylor & Joudrey, 2009, pp. 73-76). What is significant about the Paris Principles, however, is that it was the first set of international cataloging rules, meaning that information organizations around the world agreed to abide by these standards (Taylor & Joudrey, 2009, p. 76). Furthermore, American and British librarians continued to cooperate in updating the Paris Principles as the mid-to-late twentieth century and early twenty-first century saw a great deal of technological advancements. For example, the Anglo-American Cataloging Rules (AACR) were developed in 1967, and just over ten years later AACR2 was established as it added “non-book materials…to take account for the machine processing of bibliographic records” (Taylor & Joudrey, 2009, p. 77). However, the term non-book materials does not necessarily mean that the resources were electronic; e-resources were taken into account during the development of (what should have been) AACR3, but both the amount and extent of the changes made from AACR2 resulted in a complete overhaul. The new result, Resource Description and Access (RDA) was completed in 2009, and this is what catalogers today use as the basis for organizing information. The placing of subjects into categories; in organization of information, classification is the process of determining where an information resource fits into a given hierarchy and often then assigning the notation associated with the appropriate level of the hierarchy to the information resource and to its surrogate (p. 448). Essentially, classification groups materials of similar subject areas together, making information easier for users to access because like subject areas are in the same vicinity. The notation described by Taylor & Joudrey (2009) is referred to a call number, which is usually found on the spine of a resource for visibility. Depending on the information setting (e.g. public or academic libraries) the call number system varies. Academic libraries use the Library of Congress Classification System, while public libraries use the Dewey Decimal System. However, as my cataloging experiences are in academic library settings, the focus will be on the former, but as I recently discovered, these two systems overlap (Dewey Decimal in the UIUC Bookstacks). Classification systems have been in development since the early nineteenth century, beginning with the organization of personal libraries as public libraries were not yet established (Taylor & Joudrey, 2009, p. 78). It was not until later in the nineteenth century (when public and academic libraries began to have presence) that the modern classification systems took shape. In America, Melvil Dewey (1851-1931) developed the Dewey Decimal System which “divided all knowledge into 10 main classes, with each of those divided again into 10 divisions, and each of those divided into 10 sections—giving 1,000 categories into which books could be classified” (Taylor & Joudrey, 2009, p. 78). While the Dewey Decimal System is used in public library settings, it is a prominent advancement in cataloging and classification. In comparison, academic library settings use the Library of Congress Classification System which contains subject divisions “based on letters of the alphabet” (Library of Congress Classification). However, there is overlap in that part of the Library of Congress (LC) call number is based on Dewey Decimal classification. Charles Cutter (1837-1903)—whom the Cutter Number was appropriately named after—designed a system of classification which uses the Dewey Decimal System to organize materials by title (Dewey Decimal in the UIUC Bookstacks). Though the Cutter Number system is effective, there are instances in which materials are organized using an author or editor’s last name. Usually, this occurs when there is more than one author or editor attributed to a resource, though this is not always the case. In discussing the formation of call numbers, it is important to explain the organization of Irish music, but before including the Irish element, a summary of how music is organized is necessary. Musical materials differ from other types of resources because music is organized by what it is rather than what it is about. This type of organization only applies to music scores, meaning that books about music are classified in the same fashion as books in other subject areas. The following examples (as they relate to Irish music in some way, shape, or form) should help readers understand why music is organized differently from other materials, and why the effects of Westernized cataloging practices are still present. Firstly, because modern views of Irish music—or any region of the Celtic diaspora, for that matter—are socially constructed, one needs to know that Irish music is not classified as such (Calvo-Sotelo, p. 57). Therefore, per LC Classification, all music within the Celtic diaspora is classified as Celtic music (see Figure 1a). Figure 1a. Celtic music as the overarching classification for music of the Celtic diaspora. 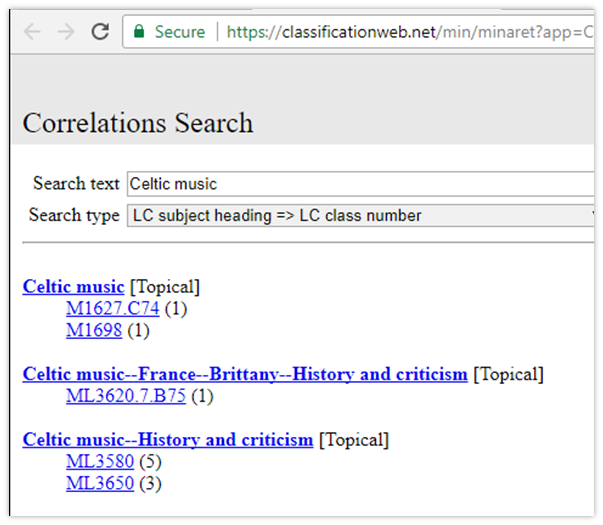 Notice how Figure 1a includes specific geographic reference to Brittany; this is significant because the approved Library of Congress Subject Heading (LCSH) for materials about Celtic music is Celtic music. Figure 1b showcases Celtic music as the approved subject heading, but notice that the subject heading can “subdivide geographically;” this connects back to Figure 1a. (classificationweb.net). Therefore, Irish music is not an approved subject heading because Irish music is classified under Celtic music! Figure 1b. Celtic Music is the approved LCSH. Source: www.classificationweb.net. Discussion of specific examples, then, will build upon the call number and subject heading organizational methods. The first textual example to be discussed is Celtic Modern: Music at the Global Fringe, edited by Martin C. Stokes and Philip V. Bohlman. As there are two editors to this book, the Cutter Number could be based on Stokes because he is the first editor listed. However, UNCG’s catalog record has a Cutter Number based on the book’s title. Figures 2a and 2b represent these possible Cutter Numbers. The subject heading for this book, as the contents are not limited to one specific region of the Celtic diaspora, correlates to Celtic music—History and criticism (refer to Firgure 1a). In putting these elements together, a complete call number is represented in Figure 2c. Figures 2a-2c: Cutter Number for Stokes; Cutter Number for Celtic; full call number. One other textual example to discuss relates specifically to Irish music. Music in Ireland: Experiencing Music, Expressing Culture is part of the Oxford Global Music Series, which contains twenty-six texts on the musical traditions of specific geographic regions around the world. Because each book is classified based on the geographic region it represents, the series is shelved in various locations. Also, as each book has the same title, the Cutter Number is assigned to the author. As Music in Ireland has two authors, the first author listed receives a Cutter Number (Figure 3a). Figure 3b represents the completed call number. Figures 3a and 3b: Cutter Number for Hast (first author listed on the resource); full call number. While textual materials are about music, it is important to discuss how music scores are classified as the process differs compared to texts. As mentioned earlier, music scores are classified by what they are (essentially, by genre); geographic region is not considered here because the goal is to keep all scores of the same genre together. The example that I am about to discuss, while it highlights this organizational method, does not have a catalog record in UNCG Libraries or Library of Congress. Using my knowledge of cataloging and classification, I created my own call number for this example to showcase 1). the classification, and, 2). a musical selection that represents Irish music in specific. String Quartet no.3 by Dave Flynn is a significant example to discuss because Flynn is a “leading authority on the interaction between Irish folk music and modern composition, receiving a PhD on the subject through the DIT Conservatory of Music and Drama” (Dave Flynn: About). Flynn is also the founding member of the Irish Memory Orchestra, as his site states (Dave Flynn: About). The orchestra is a mixture of Irish traditional instruments and Western Classical instruments, though no sheet music is used in performances, making it the “first and only orchestra in the Western world to play exclusively from memory” (Irish Memory Orchestra: About Us). While this is significant in the modern transmission of Irish traditional music, I must first describe the classification for Flynn’s String Quartet no.3. Firstly, as shown in Figure 4, all string quartets that consist of two violins, viola, and cello receive the classification M452. From here, each string quartet is organized alphabetically by composer (see Figure 5a for the Cutter Number). In terms of the selection’s title, String Quartet is not considered because most string quartets are titled as such. Therefore, no.3 is included as part of the call number so users can find the third string quartet written by Dave Flynn. The completed call number is represented in Figure 5b. Figure 4: classification for string quartets (two violins, viola, violoncello). Source: www.classificationweb.net. From the earliest moments of the modern Internet’s existence, folklore was a central component of the domain, moderating the intersection of computer professionals with hackers, newfangled lingo, and the dispersal of stories, pranks, and legends. Bruce McClelland notes that as a result, ‘the boundary between the actual and the virtual began to become blurred’ (p. 2; Jennings, 1990; McClelland, 2000, p. 182). Because music is a social process, it is a way of information sharing and exchange. To categorize the musical traditions of multiple regions as one commodity is to undermine the localities of each region. The idea of Celtic, then, can only exist in the commercial realm. With increased access to musical materials, more people can listen to Celtic music and believe that it is in fact Celtic; what needs to be made clear is that this is not a truthful way of expressing the musical landscapes of the various places labeled as Celtic. As “individual artists negotiate their creative ideas and their messages through globally mediated products,” the differences between real and imaginary will only continue to obscure (Reiss, 2003, p. 164). Flynn’s Irish Memory Orchestra, then, exemplifies the obscurity of boundaries because it blends Irish and Western musical elements. “The Irish Memory Orchestra now represents Ireland internationally as the only orchestra of its kind, focused purely on the presentation of Irish traditional music, old and new, in contemporary orchestral settings and new works inspired by the tradition” (Irish Memory Orchestra: About Us). As the orchestra performs around the globe, a wider audience is reached, providing a greater number of people access to Irish music. Though the orchestra strives to present Irish music in its traditional context, the inclusion of Western instruments is an example of how a tradition can change over time. Such changes, as documented by Daithí Kearney (2012) occur even in present day (p. 136). To conclude, one final question needs to be addressed: “How can oral traditions, which live to morph and morph to live, ever provide suitable, sustainable support for the unimaginably rich and complex embeddedness we know as ‘culture’?” (Foley, 2012, p. 66). In other words, can information organizations successfully document and preserve oral traditions as they constantly evolve? As discussed in this paper, information organization is based on Western, taxonomic thinking; therefore, in order to organize information, it must be codified in some way (e.g. written down). The developments that took place in industrialized England and America prove that modern information organizations still rely on such thinking to effectively operate, though in today’s post-colonial society, it is increasingly problematic to continue this method of organization. Though a problem-solution scenario, information organizations can work with indigenous communities to properly organize their materials (see, Duarte & Belarde, 2015). However, the amount of technological advancements makes information organization a more difficult task as the number of information formats increases in correlation with these advancements. As Sean Williams (2010) states, “What this cluster of timing, market forces, music, and a pervasive need for authenticity has created is an ‘everything and nothing’ sensibility” (p. 214). The Celtic phenomenon, then, is not only a part of popular culture as information organizations classify materials from the various regions in the Celtic diaspora as Celtic. Blank, T. J. (2009, Ed.). Toward a conceptual framework for the study of Folklore and the Internet. In Folklore and the Internet: Vernacular Expression in a Digital World (pp. 1-20). Logan, UT: Utah State University. Calvo-Sotelo, J. C. We’re on the Celtic fringe: Music and nationalism in Galicia. Global Popular Music Series (pp. 53-63). Retrieved from http://www.globalpopularmusic.net/?page_id=221. Cloonan, M. V. (2001). W(h)ither preservation? The Library Quarterly: Information, Community, Policy 71(2): pp. 231-242. Retrieved from http://www.jstor.org/stable/4309507. Dave Flynn: About. Retrieved from http://www.daveflynn.com/about.html. Dewey Decimal in the UIUC Bookstacks: The Cutter Number. University of Illinois at Urbana-Champaign. Retrieved from https://www.library.illinois.edu/circ/tutorial/cutter.html. Duarte, M. E., & Belarde-Lewis, M. (2015). Imagining: creating spaces for indigenous ontologies. Cataloging and Classification Quarterly 53, no. 5-6: pp. 677-702. Retrieved from http://digitalrhetoricandnetworkedcomposition.web.unc.edu/files/2016/01/duarte-and-belarde-creating-spaces-for-indigenous.pdf. Foley, J. M. (2012). Oral Tradition and the Internet: Pathways of the Mind. Urbana, IL: University of Illinois Press. Hast, D. E., & Scott, S. (2004). Historical Communities: Music, Dance, and the Making of a Nation. In Music in Ireland: Experiencing Music, Expressing Culture (pp. 20-42). Oxford Global Music Series. New York, NY: Oxford University Press. _____. (2004). Irish Music and the Global Marketplace. In Music in Ireland: Experiencing Music, Expressing Culture (pp. 121-136). Oxford Global Music Series. New York, NY: Oxford University Press. Irish Memory Orchestra: About Us. Retrieved from http://www.irishmemoryorchestra.com/. Kearney, D. (2012). Radio and regions in Irish traditional music. In Thérèse Smith (Ed.) Ancestral Imprints: Histories of Irish Traditional Music and Dance (pp. 128-140). Cork: Cork University Press. Library of Congress Classification. The Library of Congress. Retrieved from https://www.loc.gov/catdir/cpso/lcc.html. Reiss, S. (2003). Tradition and imagery: Irish traditional music and the Celtic phenomenon. In Martin Stokes & Philip V. Bohlman (Eds.) Celtic Modern: Music at the Global Fringe (pp. 145-169). Lanham, MD: Scarecrow Press. Taylor, A. G., & Joudrey, D. N. (2009). Development of the Organization of Recorded Information in Western Civilization. In The Organization of Information (pp. 67-87). Westport, CT: Libraries Unlimited. Williams, S. (2010). New contexts in music and dance. In Focus: Irish Traditional Music (pp. 231-236). New York, NY: Routledge. Williams, S., & O’Laoire, L. O. (2011). Irish masculinities: The Irish tenor and the sean-nós singer. In Bright Star of the West: Joe Heaney, Irish song-man (pp. 139-155). New York, NY: Oxford University Press. Christopher Girgenti, MLIS is a Library Specialist at Winthrop University (Rock Hill, South Carolina, United States) where he maintains the print and electronic serials catalog. His interest in cataloging began while working as a technical services student employee during his master’s degree, which he recently obtained from The University of North Carolina at Greensboro. While pursuing the MLIS degree, Christopher was active in the School of Music and took courses in music theory and ethnomusicology. With his extensive background in music, Christopher hopes to someday become a music librarian.